Putting the good life within reach, our great looking Accident Free 2017 Nissan Sentra SV Sedan is a standout in Aspen White! Powered by a reliable 1.8 Liter 4 Cylinder that offers 124hp while connected to a seamless CVT for smooth shifts. This Front Wheel Drive combination yields near 37mpg on the highway with three drive modes available to suit your mood and promises satisfaction behind the wheel. Bask in the smart design of our Nissan Sentra SV with its dramatic flowing lines, signature grille, and brilliant boomerang-shaped halogen headlights. The well-designed cabin of our SV offers plenty of space, an Advanced Drive-Assist display, Nissan Intelligent Key with push-button start, air conditioning, full power accessories, and a 370Z-inspired leather-wrapped steering wheel with mounted controls. It's easy to keep tabs on your digital world with our color display, Bluetooth, Siri Eyes Free, and available SiriusXM radio. 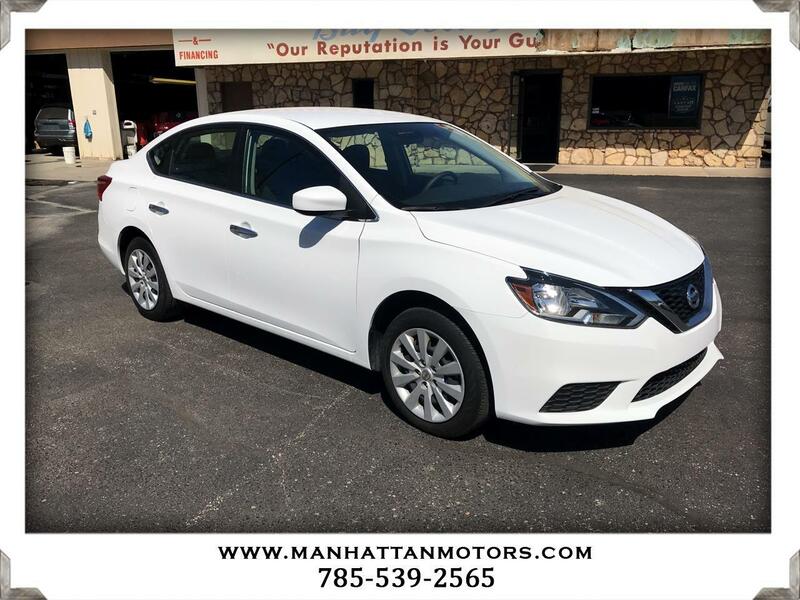 This Sentra from Nissan received superior scores and comes well-equipped with a rearview monitor, an advanced airbag system, an anti-lock braking system with G-sensor, vehicle dynamic control, traction control, and a tire pressure monitoring system. We know you'll appreciate the confident handling and classic good looks of our sedan and will be happy with this choice for years to come. Print this page and call us Now... We Know You Will Enjoy Your Test Drive Towards Ownership! Thanks for choosing Manhattan Motors. We recently won The Manhattan Mercury Readers' Choice Award for being the #1 Used Car Dealer. Buyers enjoy our "laid back" approach. No test drive routes or high-pressure salesmen. Our focus is to offer all of the information you need to help make the best decision for your family or business. Each one of our vehicles undergoes a 30-point vehicle inspection by Burnett Automotive, Manhattan's #1 Auto Service Facility. We are also the area's only Independent USAA Certified Dealer, offering discounts on purchases and interest rates.